Pendant is about .5" by .5", on sterling cable chain with lobster clasp. Please choose 16", 18", or 20" chain lengths. Model in photo is wearing 16" chain. I etched this classic bee on to an original copper hexagon using ferric chloride and different resists. After cleaning and finishing it, I made a mold so I can now cast this piece in any metal you like! This listing is for an oxidized sterling silver hexagon, with a natural matte finish. The etching has added oxidation for a nice contrast. Clean tarnish from your necklace and chain with the included polishing swatch, or any commercial jewelry cloth. Liquid cleaners would remove the oxidation though. Would you like a special message on the back? Engraving is available for $13. Please allow 3-5 additional business days for engraving. You can select the engraving option at checkout, then leave a "note to seller" with the message you would like. You can send any font requests as well. Please remember it's a very small pendant, so it can only fit a word or two. 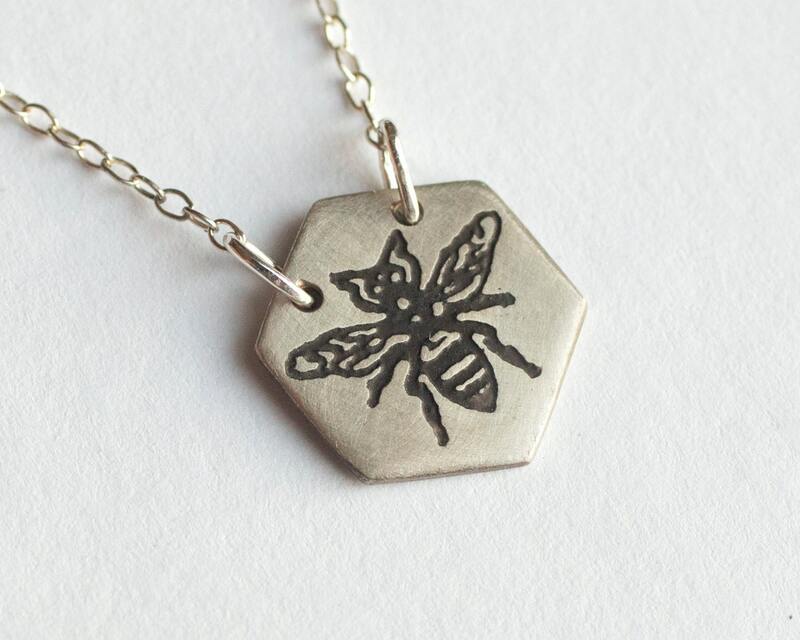 Great gift for any beekeeper, gardener, queen bee, or nature-lover in your life. It's a perfect simple necklace that goes with anything. I wear my solid gold one nearly every day! a gift for my wife. she was so thrilled! the engraving was great and the style is perfect.